Here in Wisconsin, we know how important it is to get repairs and maintenance done before the winter weather hits. Once the snows start falling, it's virtually impossible to do any outside work, especially once the temperatures head below zero. That's probably why we get so many calls around this time of year from people wondering how to get stains out of their asphalt driveway. Asphalt driveway stains seem to accumulate in the summer and autumn. Dark 'shadows' on asphalt linger behind from piles of leaves or mulch. 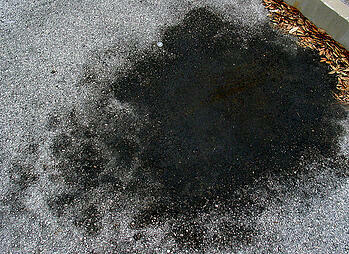 Luckily, you don't need an asphalt paving specialist to clean a stained asphalt driveway. It's easy to do yourself, with nothing but common household items. Whether it’s leaves, oil, chalk or paint, removing stains from asphalt can be tough! Follow these DIY tips from our experts to remove unwanted stains from your driveway or parking lot. Step 1: The first step to stain removal is to clean your asphalt surface. No matter what caused the stain or how you decide to remove it, use a hose to clear away as much of the debris as possible.Click here to learn more about the do’s and don’t of pressure washing asphalt. Step 2: Next, use a household cleaner on the stain, like soap, diluted vinegar or dishwashing liquid. There are many environmentally friendly options that may be a good choice for you. Use a stiff bristled brush to scrub suds in, rinse and repeat. Get more tips on stain cleaning now, like how long you should let the cleaning solution sit on the stain. Removing oil spills and vehicle fluids can be a very tricky business. Our experts have some sound advice you should consider trying. Step 1: Try to absorb as much as of the excess liquid or spill as possible. Non-clump cat litter, sawdust or gravel are all great options for liquid absorption. These materials will soak up any of the liquid you cannot remove with a rag or towel. Sometimes it is best to leave the cat litter, or other material, on the stain overnight. Learn more about cleaning now. Step 2: Sweep away the material and spray the stain with a hose to clean it off. Next, you’re ready to try a cleaning solution to help remove the stain. Did you leave your pile of mulch on your driveway too long? Did you accidentally spill some oil while you were repairing your car? Don’t worry! We have some expert tips that can help you get the stains out of your asphalt surface. When you are ready to tackle a stubborn stain, what types of tools and cleaning solutions should you use? You’ve just read about the power of Coca-Cola and kitty litter, well, we have even more information for you in this helpful blog. Should you use a pressure washer? Maybe, but check your pressure settings. Can you use trisodium phosphate, bleach and baking soda? Perhaps, depending on the stain. Take a look as we review important driveway cleaning tips you should know. Looking for more information? Read this educational blog where we breakdown how to clean concrete, asphalt, mulch, oil and grease. Let’s take a look at some more stain-fighting advice for our asphalt pavement professionals. Even if your driveway or parking lot doesn’t have problems with stains, you should consider seasonal cleanings to help extend the lifespan of your surface and to prevent damage. A clean parking lot makes a good first impression. Regular street sweeping extends the life of asphalt, especially porous asphalt. A clean parking lot discourages littering. Clean surfaces minimize pollution to local waterways. Proper asphalt cleaning and care prevents erosion. To learn more benefits of parking lot cleaning and maintenance, click here. Trying To Remove Stains From Your Concrete Driveway? Check out our blog Cleaning Concrete: What Products Should You Use? There you'll find a list of products commonly used to clean up fresh spills and set stains, along with instructions on what you should do prior to the cleaning. At Wolf Paving, we own the materials and plants, which allows us to control the entire process and provide customers with the highest quality custom asphalt mixes to meet every specific paving need.